This workshop, which has no introductory lessons, offers Koo Schadler alumni more time to focus on individual projects. 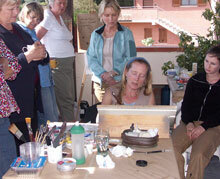 Students can select from an extensive list of painting demonstrations given by Koo. Alumni customize the week to focus on what they most want to accomplish in their painting. Open to students who have taken any of Koo’s workshops.